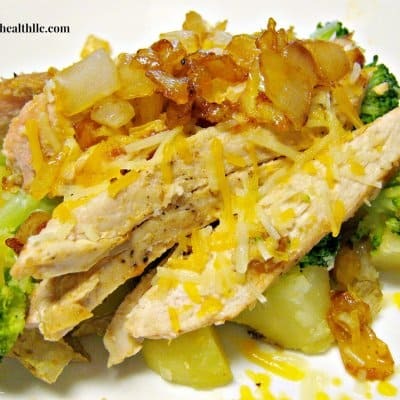 I’m always looking for easy, minimal fuss, low carb dinners to help me stay on track. Even though I love to cook, sometimes I just wanna eat! Sound familiar? 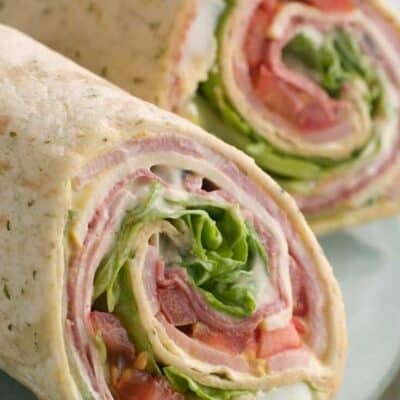 Well, I decided to make a post with all my favorite “no recipe” low carb meals so I would have them all in one place. Most of these low carb dinners require pretty basic ingredients. Check them out and add to your grocery list the items you don’t normally keep on hand. Be sure to check out my Part 2 of this post- 26 More Low Carb Meals You Can (Almost) Make Without A Recipe! Note: Want more how to details? Click on the highlighted links in the list below for more info. 1.Patty Melt Wraps– cook up a pan of cheeseburgers and wrap them in lettuce leaves instead of buns. 2.Grilled Chicken Salad- grill chicken tenders and add to salad bowl of lettuce, tomatoes, cheese, low carb dressing. Top with a few avocado chunks if desired. 3.Baked Fish and Oriental Salad- season fish filets with old bay seasoning and bake at 400 degrees until cooked -about 20 minutes. Add low carb Asian dressing to a bag of slaw mix- toss in a few roasted chopped peanuts and toasted crushed ramen noodles for crunch as desired. 4.Zoodles and Meatsauce- brown ground beef or ground turkey and add low carb spaghetti sauce or a can or seasoned tomatoes. Serve over a bed of zucchini noodles. Top with parmesan cheese as desired. 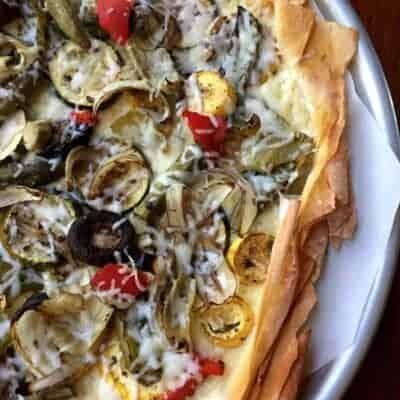 5.Flatbread Pizza– start with a low carb flatbread or tortilla and add leftover chopped meats, chopped veggies, olives and cheese. Bake at 375 degrees until cheese melts. 6.Veggie Omelet- coat a skillet with olive oil and saute veggies such as peppers, onions, tomatoes, spinach. When veggies are tender remove and add a few slightly beaten eggs and cook until set. 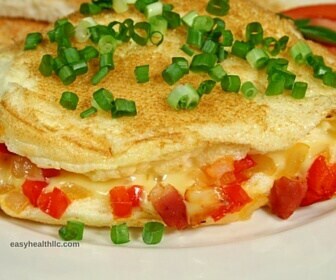 Top with veggies and cheese as desired. 7.Chef’s Salad- add chopped turkey, ham, bacon, cheese to your lettuce and tomato salad. 8.Grilled Steak & Veggie Platter- grill your favorite cut of steak alongside veggies like onions, peppers, squash, zucchini, etc. 10.Egg Roll Bowl– lightly coat a wok with oil and heat ground pork or sausage until fully cooked. Remove and drain excess fat from wok. Add a bag of slaw mix to wok and sprinkle with soy sauce, ginger and sesame oil (as desired). Cook until slightly wilted then add meat back to slaw mix and toss. 12.Chicken Cordon Bleu Bake– lightly coat an oven proof skillet with oil and cook chicken tenders until brown- (tenders will finish cooking in oven). Arrange tenders in skillet and top with a dab of cream cheese, some diced ham and a sprinkle of cheddar cheese. Bake at 375 degrees until chicken is fully cooked about 15-20 minutes. Serve with a salad or steamed veggie. 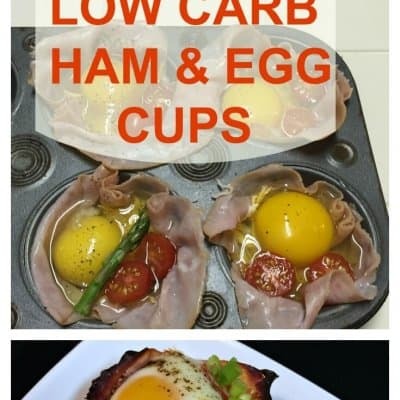 13.Baked Eggs in Ham Cups– line muffin cups with a ham slice. Drop an egg in and bake at 400 degrees until egg is cooked- about 15-20 minutes. 14.Fajitas in a Flash- place chopped peppers, onions and chicken tenders in a baking pan. Sprinkle with fajita spices and a dash of olive oil and bake at 400 degrees until chicken is fully cooked and veggies are tender- about 30-35 minutes. 15.Herbed Chicken and Veggie Bake- Add chicken pieces to a baking pan and sprinkle with your favorite herbs, add veggies like carrots, peppers,etc and bake at 375 degrees until chicken is fully cooked- about 45 minutes. 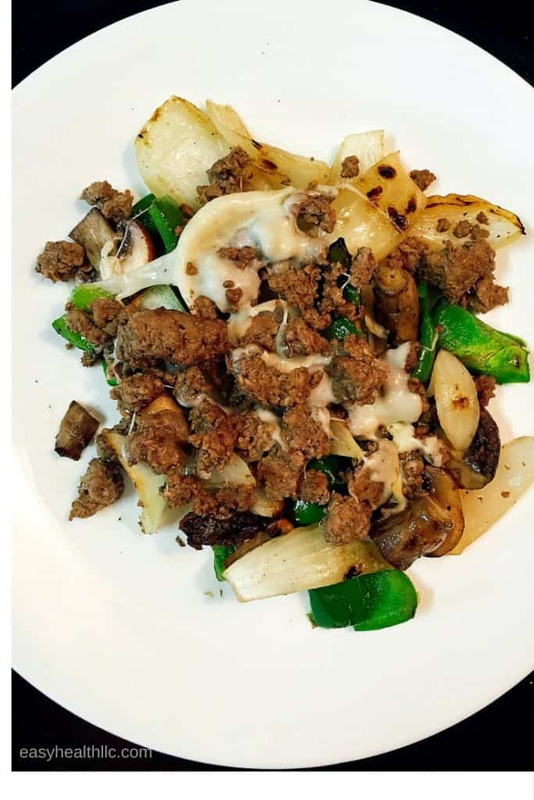 16.Low Carb Philly Cheesesteak Bowl– Add 1-2 teaspoons olive oil to skillet and saute chopped peppers and onions with ground beef or thin sliced leftover steak until veggies are tender. Sprinkle with worcestershire sauce and top with your favorite white cheese. 17.Chicken Salad (make your own or check label for carbs if prepared)- serve in lettuce cups or on sliced cucumbers. 18. Low Carb Stuffed Mushroom Pizzas- stuff portabello mushrooms with low carb tomato sauce, cooked sausage, pepperoni, cheese. Place in 350 degree oven and bake until mushroom is tender- about 15-20 minutes. 19.Low Carb Taco Salad Bowl- brown and crumble ground beef and sprinkle with cumin and chili powder or taco seasoning mix as desired. In large salad bowls, layer lettuce, tomatoes, meat, cheese, avocado, sour cream, low carb salsa. Crisp a low carb tortilla in the oven and cut into strips- add a few strips to each salad if desired. 28 days of menus (breakfast, lunch and dinner) for 30gm carb/meal, 45gm carb/meal and 60gm carb/meal diet plans. Over 80 easy-to-fix, dietitian-tested recipes designed to help those with limited cooking skills feel confident in the kitchen. 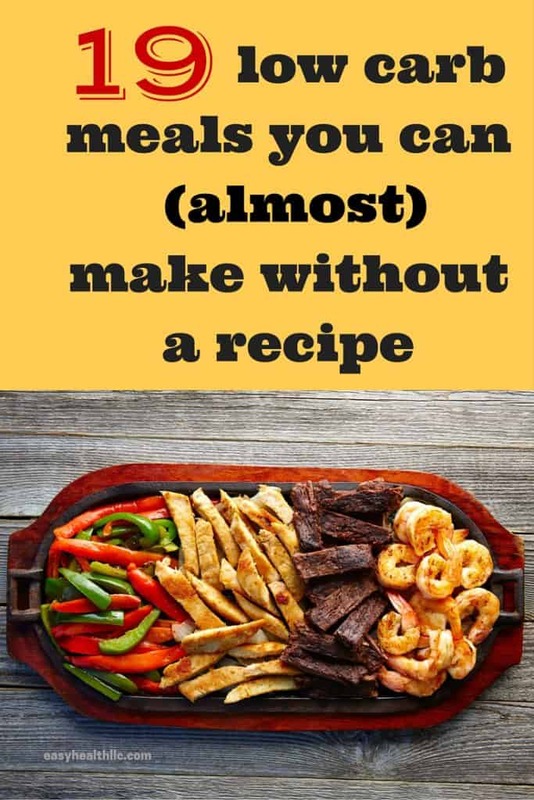 Tasty recipes use easy-to-find ingredients and most use less than 6 items! Get your healthcare provider’s input on which carb level is right for you then let Menu Me! make meal planning easy! Thank you for this list. I was looking for some low-carb options to help with my weight loss journey. You are welcome Natasha. Thanks for visiting Easyhealth Living!